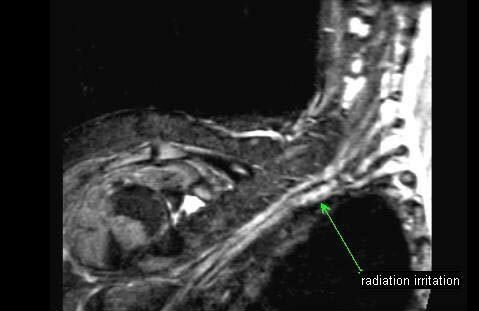 We focus on a 39-year-old female referred by a neurosurgical clinic for evaluation of the right brachial plexus. Clinical Background: The patient had undergone a lumpectomy for right breast cancer. Since the margins were not clear she underwent a second a larger lumpectomy. She then received 42 sessions of radiation therapy. She recalls the radiation was mainly covering the right breast area and did not involve the axillary or the neck regions. She went back to her work (postal services) which required both repetitive motions with lifting and lifting heavy items. About nine months later, she noticed swelling and aching pain in her right arm. The pain and swelling would often come when she woke in the morning and with activity. She was evaluated by her oncologist and was placed on restricted work and sent to PT for lymphedema. The treatments did not improve her symptoms. She has had MRI of her brain, and cervical spine, and 2 EMG studies. None of her reports indicated any attributable pathology. 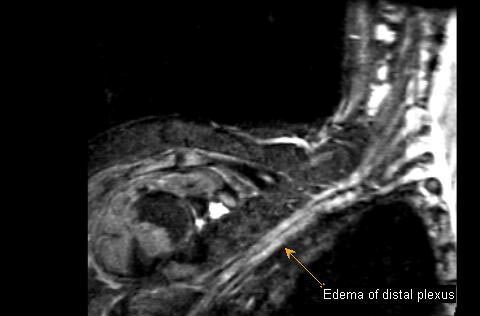 The neurologist managing her care indicated that she had a negative right brachial plexus MRI, but the imaging was not available for review. Her EMG results were normal except for mild carpal tunnel. Her pain had progressively worsened and was being managed with narcotic medication. Clinical Findings: No lymphadonopathy or thyromegaly. Distal pulses intact. Good brachial and radial pulses and these did not change with arm movements. Mild swelling of the hand on the right side, none on the left side. Neurologic exam: Alert, normal speech, normal cranial, normal reactivity. Motor: normal bulk, tone and strength bilaterally. She had pain in the right arm during the exam. On sensory exam she reports some decrease in pin prick in a circumferential fashion just below the elbow on the left side and just above the elbow on the right side. Assessments: She does not seem to have significant degree of motor or sensory deficits caused by significant brachioplexopathy. She could be experiencing complex regional pain syndrome. This could be a radiation injury as well. She was mildly positive on additional EMG testing. We will schedule an MR Neurography of the brachial plexus and evaluation of her wrist for median nerve pain with wrist splints. Post radiation edema within multiple elements of brachial plexus involving cervical spinal nerves, trunks, and proximal divisions. Shoulder pathology involving the subscapularis and triceps tendon as well as the glenohumeral joint. Findings: These images demonstrate the course and caliber of the brachial plexus in the right side as well as the contributory cervical and thoracic spinal nerves and descending shoulder and arm nerves. The images of the shoulder are notable for some abnormalities affecting the shoulder joint itself. There is some excess fluid in the glenohumeral joint. There is irritation and inflammation around the subscapularis tendon as well as around the triceps long head tendon. The brachial plexus elements demonstrate significant abnormality beginning at the level of the anterior scalene muscle. There is significant edema reflected by increased caliber and increased image intensity and abnormal external contour which is seen in the C6 and C7 spinal nerves and over an extensive segment of brachial plexus, approximately 8 cm in length. Distal to this the plexus resumes more normal appearance in course and caliber so that the plexus elements are relatively normal on entry into the axilla. Axillary nodes are appreciated somewhat enlarged than normal size. There is no evidence of direct tumor invasion of any brachial plexus element. 3D Impression: Irritative abnormality affecting multiple elements of the brachial plexus.